A bunch of colorful balloons and confetti create a festive setting for this birthday card! 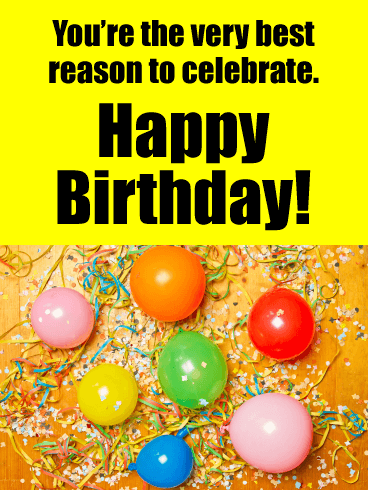 And the message says it all: they’re the very best reason to celebrate, so it’s time to get the party started! Whoever you’re sending it to, they’ll be looking forward to some fun with all the people they love being with, including you! Let’s get this party started right, and also right now! 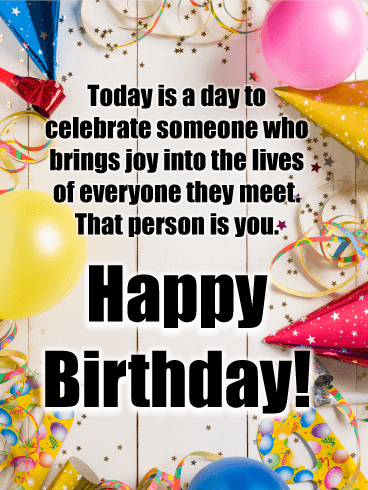 Send the Good Wishes Happy Birthday Card to someone young, old, a new acquaintance, a dear friend, your mom, your uncle, your neighbor, a coworker, etc. It works for anyone and everyone! 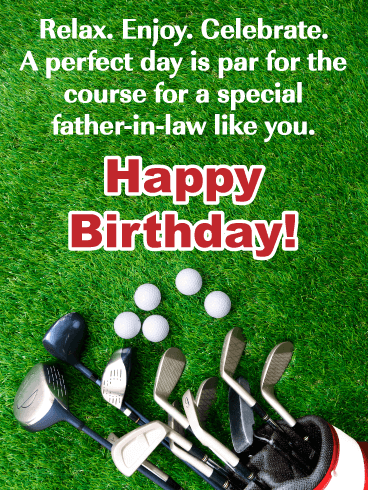 Whoever you choose to send this birthday card to will greatly enjoy the multitude of thoughtfulness you sent their way! 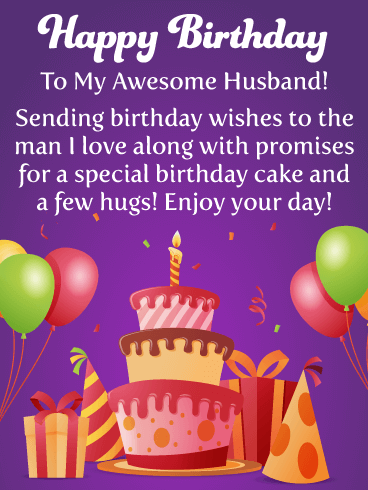 Send a very special birthday cake, fabulous presents, and celebration balloons over to your husband with this marvelous birthday card! The vibrant colors of purple, green and orange will certainly catch his eye and the message will add joy to his day. 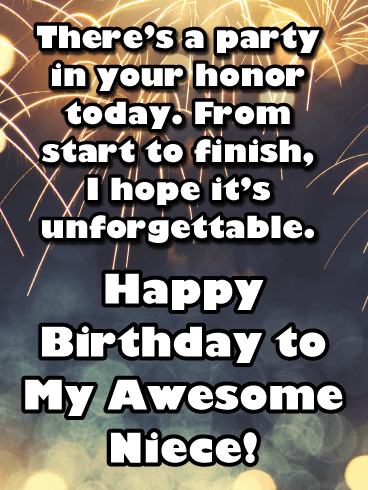 Send this birthday card along with the promise of a few hugs, it will certainly get his birthday started in a fantastic way! This birthday card is fit for a celebration beyond compare! Colorful balloons, party hats, streamers and confetti are all around, against a bright white wooden background, adding a fun and festive touch. And even more wonderful are your words, reminding them how much joy they bring to others, which is the best gift of all. 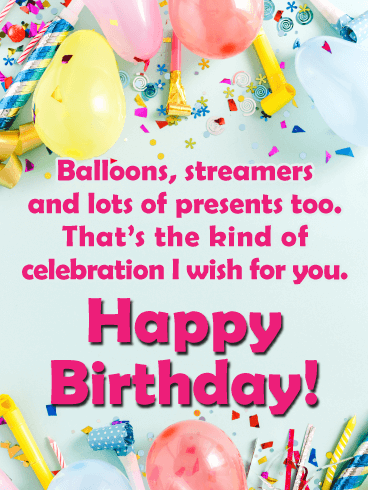 We aren’t certain anything could be more festive than this Party Streamers Birthday Card! Balloons, streamers, and confetti?! Wow! This birthday card is basically a party all by itself! 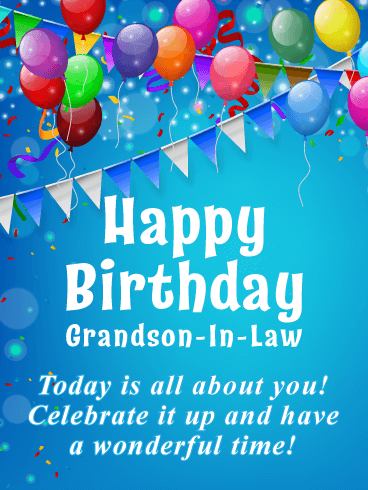 Send this happy party of a birthday card to your dear Grandson-In-Law to remind him today is all about, well, him! He should cut loose, celebrate it up, and party hard! 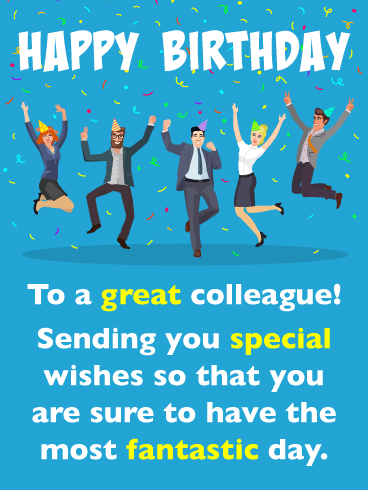 Send this exciting birthday card to the colleague in your office that you think is just great! They will certainly appreciate that you took the time to acknowledge their special day. This greeting card showcases business employees wearing birthday hats, surrounded by confetti, and clearly celebrating a very big occasion. 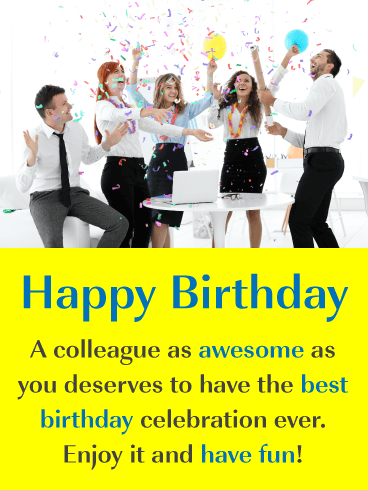 Make your colleague smile by sending this birthday card to them today! 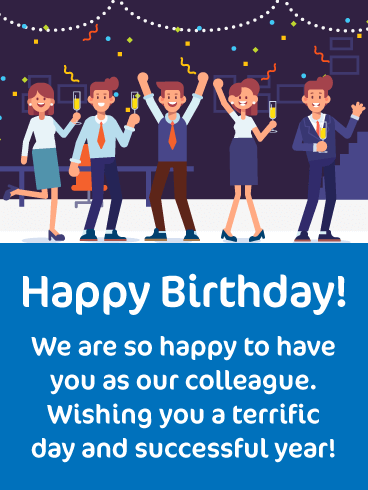 Get the party started with this festive happy birthday colleague card! It features a group of coworkers celebrating with confetti and balloons! It will surely add a little fun to your colleague’s day. 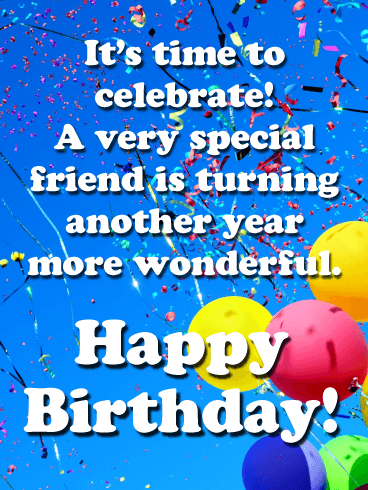 Everyone deserves to receive a birthday card on their special day so be sure to send this one on its way! Oops! Did you forget to mark an important date on your calendar? 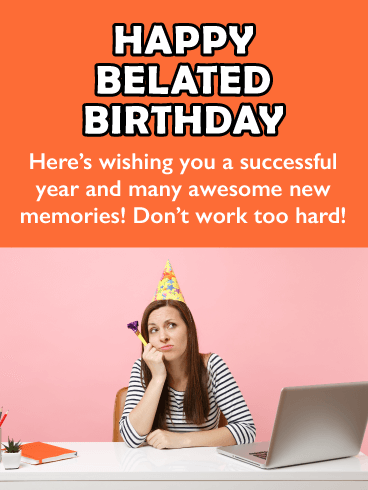 If you’ve dropped the ball and missed someone’s birthday, now you can make it up to them! How you ask? By sending them a tasteful Happy Belated Birthday Card like this one! The Don’t Work Too Hard card urges your friend to remember to enjoy life and wishes them success in their new year of life. 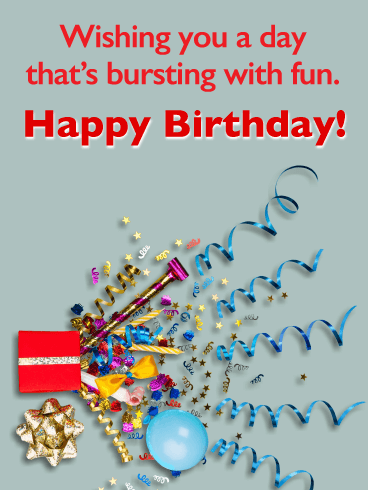 There’s a whole lot of fun to be had when you send this birthday card! Balloons, party horns, and confetti create a colorful background for their big day, and you want to help them celebrate it in the most festive way. Whoever is on the receiving end of this greeting, they’re sure to be smiling and ready to have a celebration they’ll never forget! 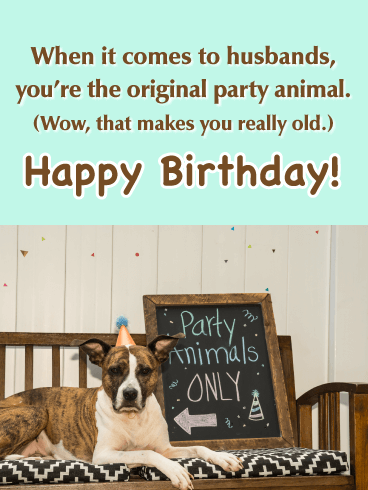 This old dog’s still down to the party, just like your husband, the original party animal! 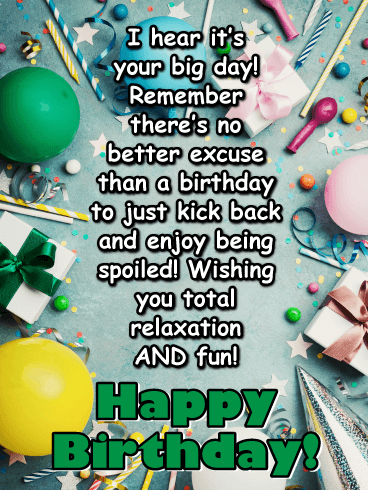 Wish him a day full of celebrating, complete with lots of laughs, when you send this fun birthday card sure to make him howl. It’s a way to kid him about his age, while still letting him know you remembered him and love him, even though he’s not the young pup he once was! 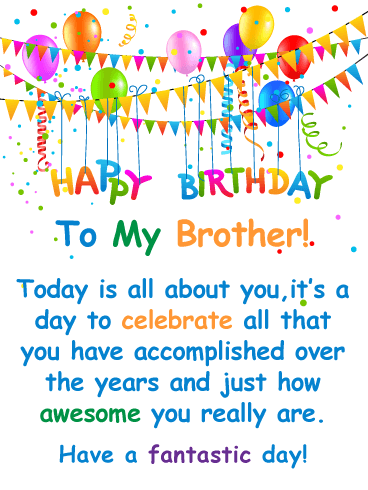 It’s time to celebrate how awesome your brother really is! This colorful and joyful birthday card looks very festive! It contains celebration balloons, confetti, streamers, and a meaningful birthday message. It expresses that this is his special day to celebrate all that he has accomplished over the years. He will be so excited to receive this birthday card, especially because it is from you! Does your brother like retro style cards? 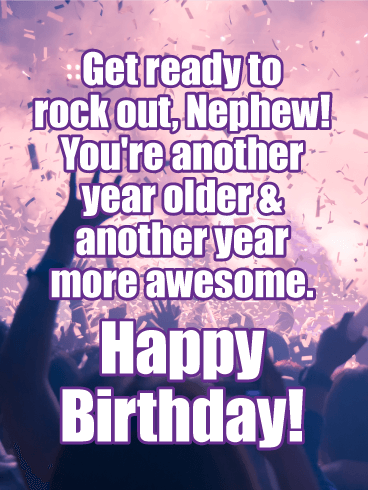 If so, he is going to love this cool retro looking birthday card! It showcases an image of a man making a toast to your brother on his big day. The illustration has a 1950s look and the happy birthday lettering looks unique and stylish. 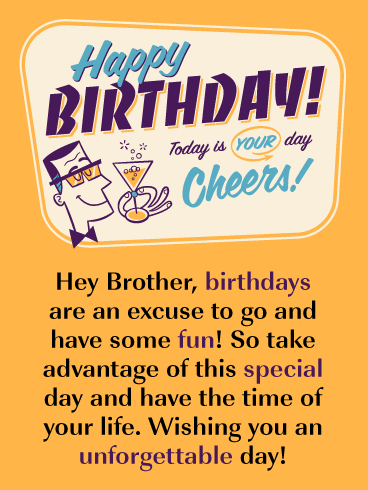 This birthday card is going to make his day, so be sure to send it right away! The scene is set for an unforgettable party, complete with a candle-topped cupcake, a party hat and lots of confetti. 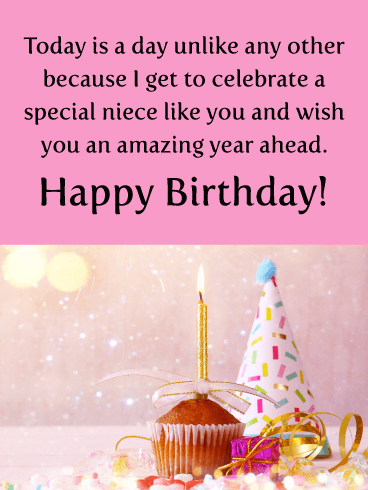 It’s a great way to wish your niece a very happy birthday! And the words are what really make this greeting special. Letting her know that you’re so lucky to be able to celebrate her and let her know that you want her to have an amazing year ahead! Golden fireworks in the sky are the perfect way to help your niece celebrate her birthday in style! With a wish for a party that’s unforgettable from start to finish, this festive greeting will have her ready to start her year off on an exciting note and make that happiness last all throughout the year. A birthday cake, presents, colorful balloons - it doesn’t get any more festive than this! 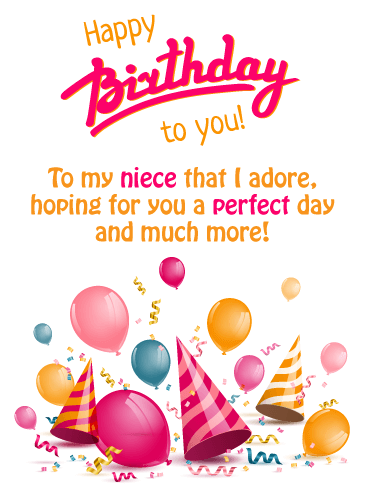 So if you want to start your niece’s special day off the right way, send this terrific birthday card her way! She will appreciate that you are thinking of her and sending the very best. This greeting card will certainly brighten your niece’s day. Don’t delay, send it to her today! 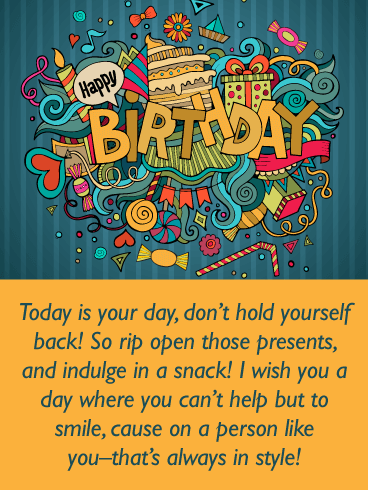 Birthdays should be fun and filled with excitement, and that’s what makes this birthday card so perfect! It contains all the elements that make birthdays special – celebration balloons, party hats, candy, cupcakes, presents, fireworks, and more! You really can’t go wrong with this greeting card! 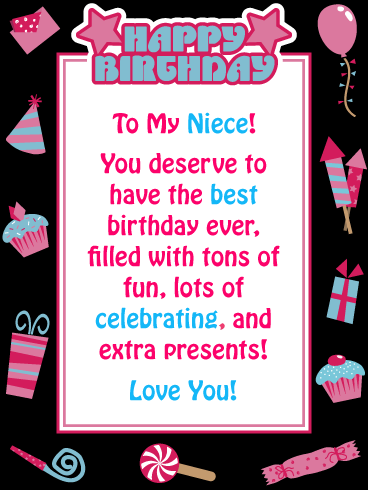 It will add fun to your niece’s big day and let her know that you love her! 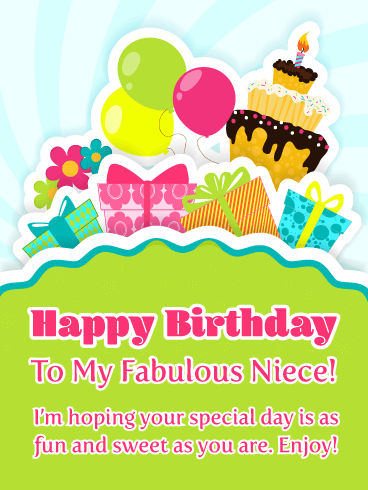 This birthday card is super cute! 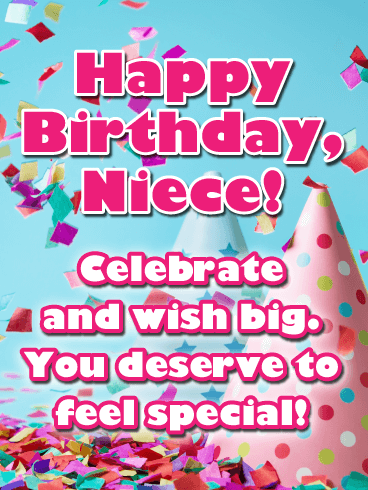 It’s a must-send if you have a niece who is celebrating her special day. 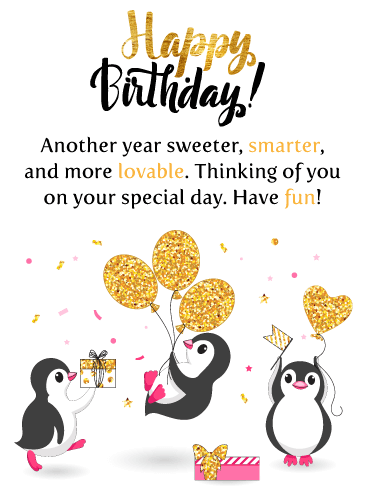 Adorable penguins, sparkling golden balloons, birthday presents, and confetti were all put together to create this lovely card just for your niece. This greeting card is so awesome, she might even show it to her friends. Get these happy little penguins over to your niece today! 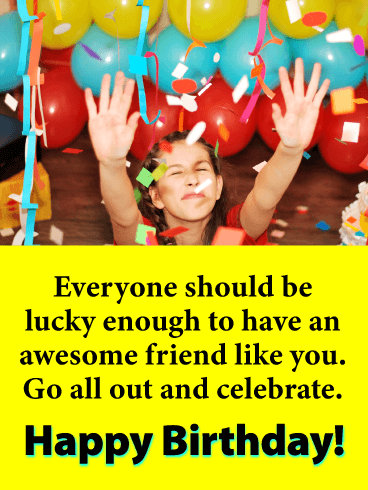 In case there was any confusion in your good friend’s mind, this card is clear: Today is all about THEM! 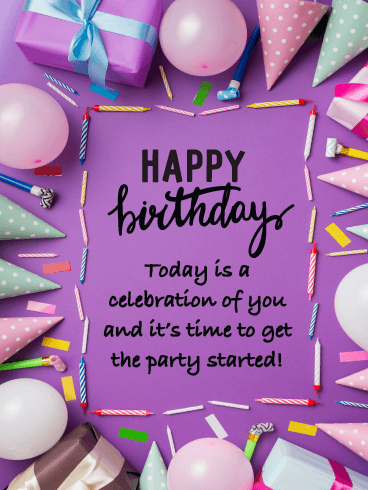 Send your wonderful friend the Purple Party happy birthday wishes card to let them know it is party time! Confetti, cake and party hats help get the message across! They deserve the best, so it’s a good thing they have you as a friend! The crew on this card is ready to celebrate someone special on their big day! 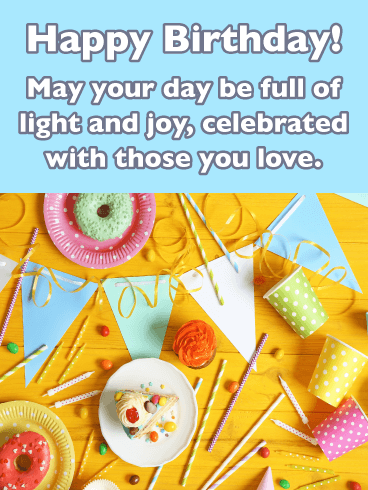 Colorful lights and confetti are all around, setting the perfect party atmosphere, while the words above let them know how awesome you think they are. What a great way to make not only this day but the year ahead, incredibly special. 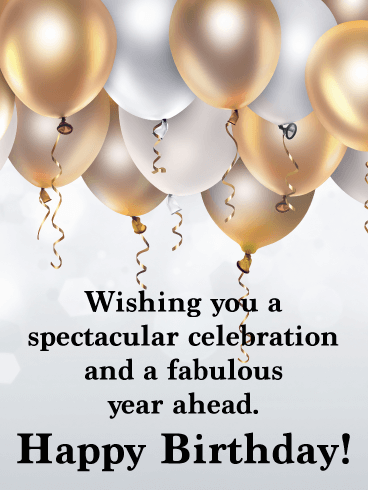 Gold and silver balloons float high above, creating a fabulous backdrop for this festive card to someone very special! It’s the perfect way to wish them a spectacular celebration and lots of happiness in the year ahead. This is the kind of greeting that will make them feel loved and remembered as they turn another year older. 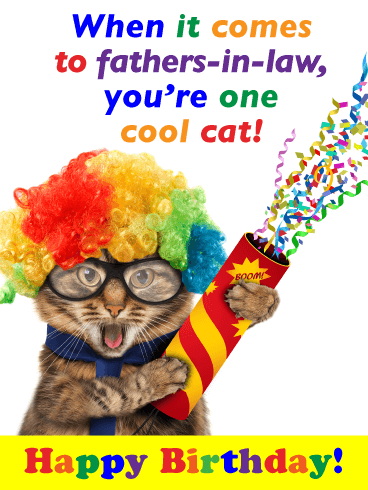 No matter what age he’s turning this year, your father-in-law will always be one cool cat in your eyes! 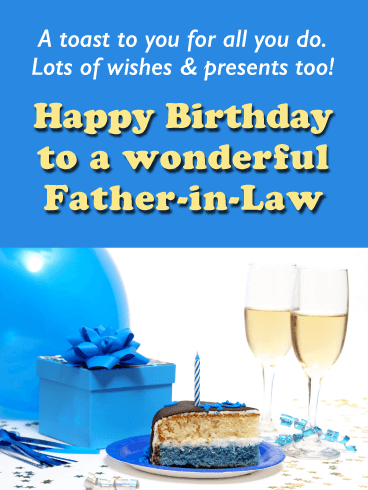 Let him know with this funny and playful card! Featuring a partying kitty in a rainbow wig and glasses, and clutching a confetti cannon in his paws, this hysterical greeting will have him howling, knowing you took the time to make him smile on his big day. I scream, you scream, we all scream for ice cream! 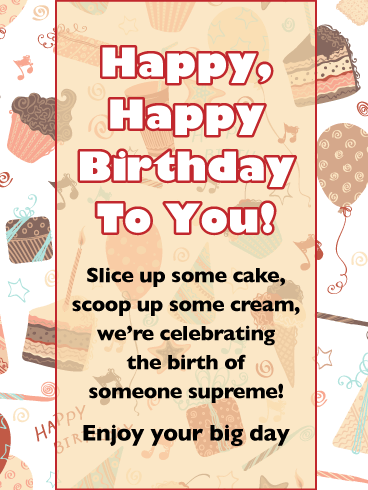 The Cake ‘N Ice Cream Happy Birthday Wishes Card is ready to be sent to anyone you know celebrating a birthday! With its fun pattern of presents, music, and treats it’s suitable for everyone, boys and girls of all ages! Send this card and get the ice cream party vibes started! Sometimes we get so caught up in life and work and being busy. Remind your friend that on their big day it’s okay to sit back and relax! Kick back, take a load off, have some cake, maybe a beer or some wine– whatever they like! 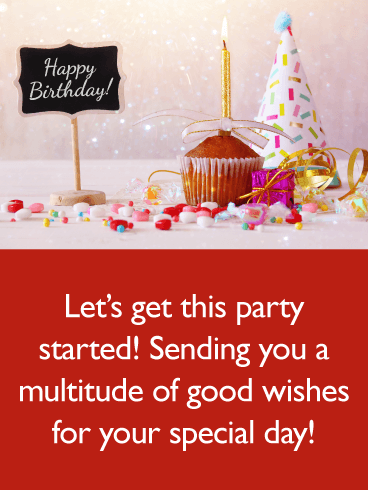 Send the Take It Easy Happy Birthday Wishes card to set the mood for the day! 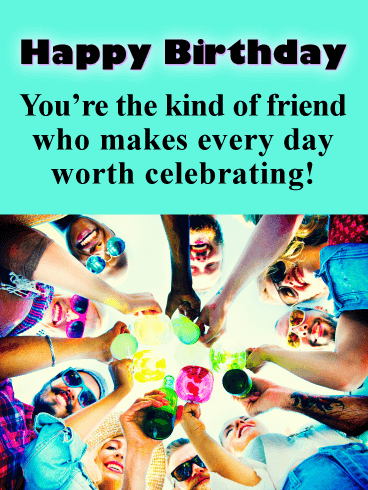 Raise a glass and send a fun card off to your friend, family member, or co-worker to celebrate their birthday! Cheers to their life and health. 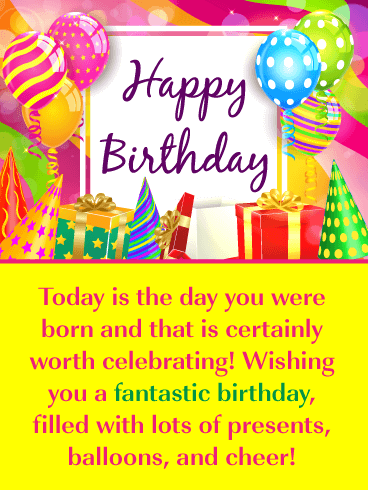 Says the Salute to Life Happy Birthday Wishes card! 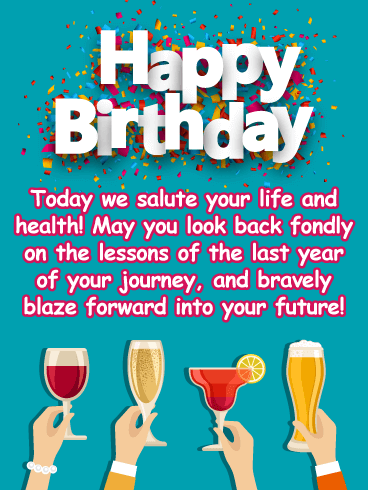 Toast the big day with a thoughtful message suggesting the recipient look back fondly on how far they’ve come and then carry on blazing forward bravely into their future! A sister is your first friend. The one by your side, helping to celebrate all the big moments in life. This year on her birthday, remind her that you’ll always be there with this sweet card. 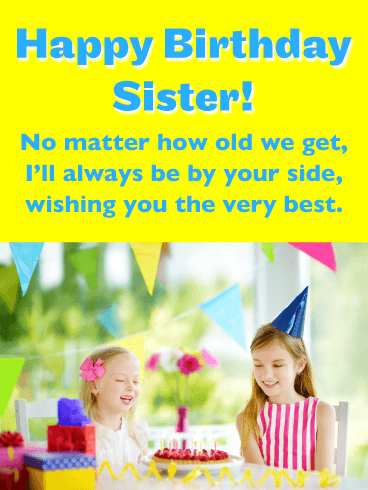 Featuring two sisters together in front of a festive, candle-topped cake and stack of gifts, streamers, and flowers in the background, it’s a wonderful way to wish her the very best, today and always. Is this a greeting card or a captivating game of I-Spy? This card is jam-packed full of fun, eye-catching designs! 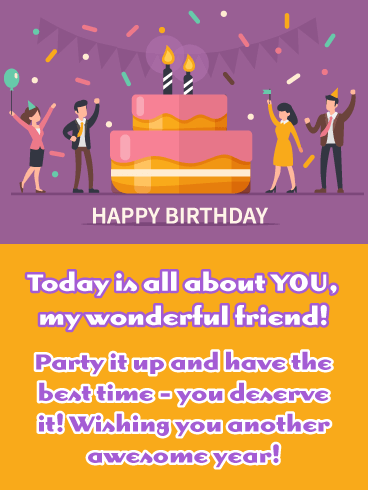 Send the cute doodles Happy Birthday wishes card to a dear friend to let them know how much you care! The birthday wish message is done in a simple rhyming scheme– delightful to read, guaranteed to crack a big smile on the recipient’s face! The whole gang is here to wish an amazing friend a very happy birthday! With drinks in hand, they’re raising a toast to someone who makes every day worth celebrating. 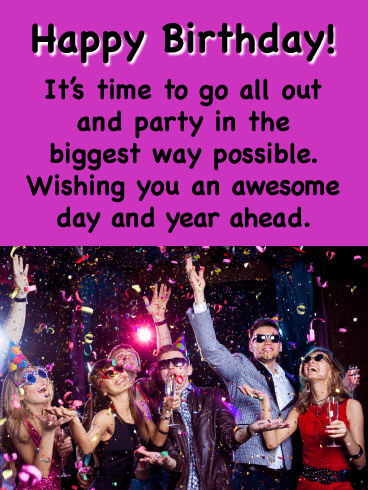 This colorful and fun card is perfect for one person or a group to send. They’re sure to feel like raising a toast when they see it! Rows and rows of colorful balloons float in the air as confetti comes down all around. 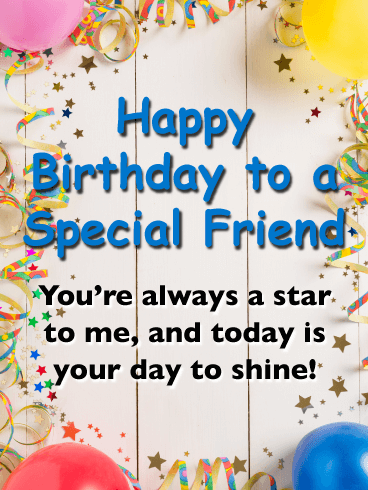 It’s a festive way to wish an awesome friend a happy birthday and let them know that it’s their day to celebrate to the fullest! So when that special date on the calendar comes around this year, put them in the mood for a party with this bright and fun greeting.